A visitation will be held on Friday, March 22, 2019 from 10:30 a.m. until 11:30 a.m. at St. Katharine Drexel Parish in Beaver Dam. A Mass of Christian Burial will begin at 11:30 a.m. with Rev. Michael Erwin officiating. Interment will follow at St. Peter's Catholic Cemetery in Beaver Dam. 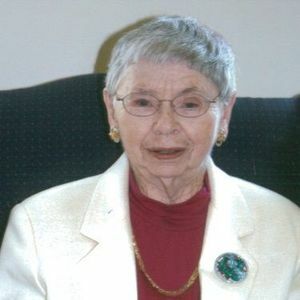 Mildred was born on July 23, 1919 the daughter of William F. and Mayme (Haas) Fenske in the Town of Manchester. She was a 1936 graduate of Markesan High School. Millie graduated from the Evangelical Deaconess Nursing School in Milwaukee in 1940. On October 10, 1945, she was united in marriage to Aaron Plankel at St. Peter's Catholic Church in Beaver Dam. Millie had been employed as a Registered Nurse for over 42 years at St. Joseph's Catholic Hospital in Beaver Dam. She was a dedicated nurse and compassionately cared for countless people over the course of her career. She was a faithful member of St. Katharine Drexel Parish and the Christian Women. Memorials in Millie's name may be directed to St. Katharine Drexel School or to the charity of one's choice.